Major Gopal Mitra lost his vision in an IED blast. 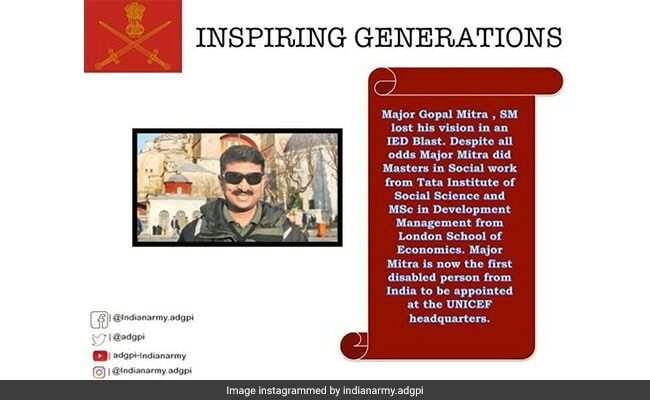 The Indian Army today shared a post on social media to honour Major Gopal Mitra, the first differently-abled person from India to be appointed at the United Nations International Children’s Emergency Fund (UNICEF). Major Mitra lost his vision in an IED Blast. “Major Gopal Mitra, SM lost his vision in an IED blast. Despite all odd Major Mitra did Masters in social work from Tata Institute of Social Sciences and MSc in Development Management from London School of Economics,” said the army in its post. “He is now the first disabled person from India to be appointed at the UNICEF Headquarters,” they wrote, adding the hashtags #Proud #Inspiration and #IndianArmy.